Description: Complete engine cover kits for the Airbus ACJ. This kit includes inlet covers and exhaust covers. Description: Engine inlet covers for the Airbus ACJ. Description: Engine exhaust covers for the Airbus ACJ. The Airbus ACJ jet engine inlet covers are available for the CMF 56-5 engines. The IAE Model V2524 and PW 6124 models are made to order and in development. 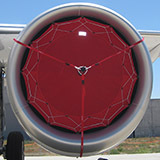 If you would like to order an Airbus inlet cover, please contact us for availability and engine model fitmet.